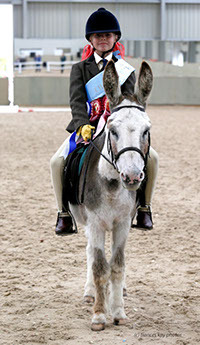 Immaculate donkeys are the stars of the shows and the Donkey Breed Society but sometimes are let down with an ‘anything will do’ appearance from their handlers. Please take pride in your appearance and do justice to both the donkey and the Society, here is some helpful tips about the correct attire to wear when showing your donkey. (Much of this list can be sourced from major supermarket outlets, car boot sales and charity shops so it need not cost a fortune to look extremely smart). Either smart trousers or a tailored skirt of an appropriate length for running. A well cut tweed or plain jacket with a pastel shirt and tie. Could be considered optional unless in a condition and turned out class, but they do give a very smart impression. Hair will need to be braided, tied back and controlled by a hair net, in which case a hat is essential as it covers the join between net and face. Can’t fail to look smart in a shirt and tie (The DBS tie is available from the DBS shop and is excellent). A Country suit or tweed jacket and trousers. A bowler, soft cap or trilby hat will complete the look. Gloves are a ‘must’ but these must never be black – soft brown leather gloves are perfect. The colour of your trousers is decided by your donkeys leg colour, they need to be contrasting i.e. 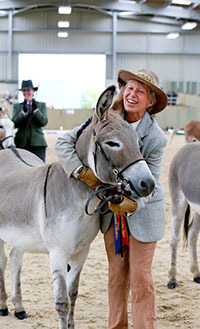 If your donkey has dark legs, wear beige trousers – light coloured donkey legs, wear dark trousers. This is so that your legs do not merge with your donkeys!